AP GO 197 Payment of remuneration / Salaries to all the contract / outsourced personnel as well as aided institutions on the 1st day of every month promptly. Payment of remuneration to the Contract/Outsourcing persons – Payment of remuneration on first of the month - Instructions to the Controlling Officers, Drawing and Disbursing Officers, Treasury Officers and the man power supplying agencies to ensure prompt payment - Relaxation of treasury control orders – Reg. AP FINANCE (HR-I. Plg. & Policy) DEPARTMENT G.O.Ms.No.197 Dated:14-10-2016. 1. CircularMemo.No.28346-C/958/A2/SMPC/2008, Finance (SMPC) Department, dated 30-09-2008. 3. G.O.Ms.No.151, Finance (HE.I-Plg.&Policy) Department, dated 08-08-2016. 1. In the reference first read above, Government have issued instructions and laid down the procedure regarding payment of remuneration to all the contract / outsourced personnel as well as aided institutions on the 1st day of every month promptly. In the Government Order second read above, comprehensive guidelines were issued regarding selection of outsourced personnel, payment of remuneration, continuation of services and grievances if any, in Government Departments. In the GO third read above, orders were issued enhancing the rates of remuneration payable to the outsourced employees from 1st August, 2016 with detailed instructions for payment of remuneration. 2. In spite of the above instructions, some instances have come to the notice of the Government of irregular or delayed payment of remuneration to the contract / outsourced personnel on account of delay in submission of the claim on the part of the agency or due to procedural constraints such as insufficient budget or delay in preferring claims by Drawing and Disbursing Officers. 3. 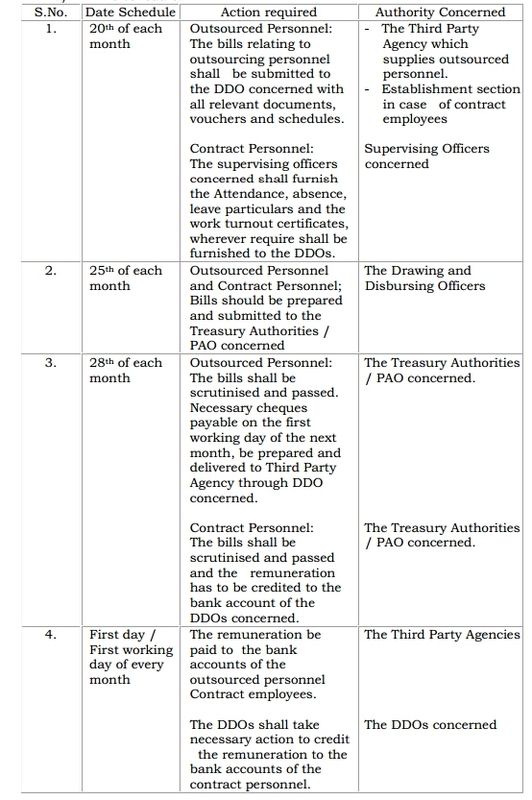 In order to ensure payment of remuneration on the first working day of every month contract and outsourced personnel Government hereby issue the following instructions for strict compliance by all the third party agencies supplying the manpower, Drawing and Disbursing Officers and Treasury authorities concerned. The above schedule shall be scrupulously followed by all the concerned authorities and any deviation will be viewed seriously and the officers concerned will be held responsible. b) In order to prevent rejection of bills which are otherwise eligible but could not be passed for want of sufficient budget provision under 300 Other Contractual Services, the Government hereby relax the Treasury Control on the detailed head of account “300 Other Contractual Services” for the financial year 2016-17 under all the Major Heads of Account. The Controlling Officers shall submit necessary proposals for provision of necessary funds either by way of re￾appropriation of savings within the grant or provision of additional funds through supplementary grants at the appropriate time without fail. c) All other conditions relating to admissibility of the claim shall be adhered to and the Treasury Officers / PAO shall ensure proper scrutiny of the claims. d) The agencies shall disburse remuneration to the outsourced personnel by first day of every month as instructed at para 3 (a) above. In case of default 1% of total claim be levied as penalty for delay in payment beyond three working days. The penalty shall be recovered from the claim relating to the succeeding month. In case of recurrence of delayed payments on more than three occasions, the agency shall be blacklisted. It is the responsibility of the officer who entered into the agreement with the agency, to ensure prompt disbursement by the agency to the outsourced personnel and to impose penalty otherwise. e) The agencies shall not pass on penalty so imposed on to the outsourced personnel or deduct any amount from the remuneration other than the statutory obligations. f) The existing contracts shall be revised duly incorporating the above penal provisions in the contract and a new contract shall be executed for the remaining period of the contract. The controlling authorities shall take prompt action in this regard. 4. All the departments of Secretariat/Heads of Departments shall follow the above instructions scrupulously. They shall communicate this order to all the subordinate officers under their control for strict compliance.